The records of the pilgrimage activity of pre-reformation Nottinghashire is an interesting area of discussion and themes clearly arise. Understandably the most common destination for the medieval pilgrim or palmer was Jerusalem or Hierusalem as it is written in the medieval records. However there is evidence of a wide range of pilgrimage locations ranging from the shrine of St James of Compostella in Northern Spain to more great English shrines such as St. William of York to more local sites such as Our Lady of Doncaster. It is clear that to all able bodied and sometimes less able seeking a cure, Medieval Christians, were obliged to go on pilgrimage. Sometimes, this was enshrined in law. In 1325, Archbishop Melton’s register records that a Sir Peter de Mauley was penalised for adultery having not to fast every Friday in Lent, Ember Days and Advent for seven years on bread, water and small beer and on Good Friday and the Vigils of All Saints on bread and water only and to make pilgrimages to the shrines of St. William at York, St Thomas at Hereford and the Blessed Virgin at Southwell and St. John of Beverley and St. Wilfrid at Ripon. Compared with today when we can take paid holidays or sabbaticals, going on pilgrimage was a far more difficult prospect. Permission was needed. In 1281, an Edmund de Everley, rector of Treswell obtained ecclesiastical sanction to be absent for three years for pilgrimage to Jerusalem. Often some sort of fee would have to be paid to the employer of those intending to go on pilgrimage. One of the earliest accounts dates from Worksop in the reign of Richard I when a Richard de Lovetot was pardoned because of his absence but had to pay scuttage, one-fifth of 100s. Sometimes pilgrimages were not officially recognised. In 1292, a William de Hoknale, vicar of Hucknall, departed covertly to the Holy land, alleging that he vowed to make this pilgrimage. Fortunately for him, the Archbishop appears to have been willing to overlook his absence, but sequestrated the income of his living and provided a priest whilst he was absent. 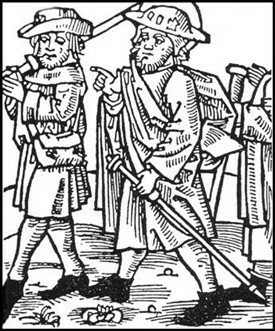 This emphasised the need to have papers appealing for safe conduct and to show that the pilgrimage was genuine as many towns did and still do have offences for vagancy. For example Patent Rolls show that in 1248 Gerard de Rodes, Lord of Langar, Clifton, Barnstone etc had letters of protection for going upon pilgrimage. John Willoughby, of Wollaton had letters signed from Henry III for safe conduct for himself and a retinue of six persons to go to St. James of Compostella. Similarly, Maud Fraunceys was given protection and safe conduct to go overseas with one damsel, one chaplain, one yeoman and four horses, and took £40 expenses. Of course such pilgrimages largely disappeared after the Reformation. This page was added by R B Parish on 10/03/2013.